In The Early 20th Century, Piggly Wiggly Grocery Stores Revolutionized The Industry With? What Popular Commodore 64 Game Spawned a Successful Television Series? Recall the last time you went grocery shopping. You entered the store, you wandered about looking for what you wanted, you picked it up–perhaps placing it in a basket or cart–and you returned to the entrance of the store to purchase it and leave. A little over a century ago, however, that would have been absolutely unheard of. You wouldn’t have had free reign of the stock shelves. You wouldn’t have hand selected the items you wanted (perhaps overlooking a bruised apple or putting a product back because the box was dinged). Instead, you would have entered your local grocer and been served by a clerk. You would have stood on one side of the counter with your list and the clerk would have scurried about behind the counter and into the stock shelves, fetching all your requested items. All that changed in September of 1916 when the first Piggly Wiggly grocery store opened up in Memphis, Tennessee. On opening day, the store was flooded with curious shoppers. They weren’t curious about the prospect of exotic produce or because the store offered some irresistible discount, they were curious because they had been invited to do their own shopping, no clerk required. Not only did the ability to wander through the aisles comparing and lingering over products boost sales, but it also slashed costs. 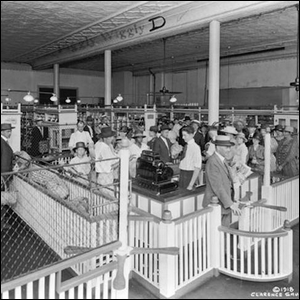 Instead of one clerk attending to one shopper at a time during the entire duration of the shopper’s visit to the store, a handful of clerks could man the registers while the shoppers themselves did the labor of locating and selecting their purchases.